I love finding organic hair and skincare companies, and was delighted to discover The Barefruit Company! I received a Women's Sugar Scrub in the Pomberry scent, and let me tell you-it is delicious! 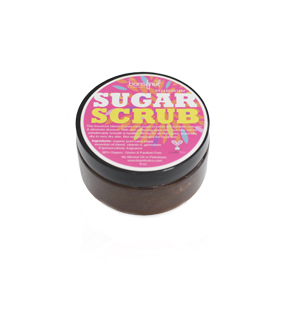 This sugar scrub is awesome for exfoliating dry skin! I use it a couple times a week, and it helps so much with my elbows and hands. And the scent is wonderful! A very fresh, fruity fragrance that literally lingers all day! It's very fun and summery smelling :) I also like that it only takes a little bit to scrub your entire body. My scrub lasted for quite a while, using it twice a week. It leaves my skin feeling soft, smooth and moisturized. After using this, I don't apply any lotion or cream-the sugar scrub provides enough hydration by itself! And the best part is, it is 98% organic! No parabens, mineral oil or petroleum! And it's vegan too! "The Barefruit Company was established in early 2009 by owner & creator Tasha Goss. She embarked on a journey to create a customizable product for the hair and skin that not only had a distinct and lasting fragrance but, contained all natural ingredients that aided the body in healing and moisturization. The first product was a body pomade that was given to the guests of an intimate home party. Today, The Barefruit Co. collection has grown from a simple body pomade, to a variety of all natural products for men, women, babies and the home. Located in Columbus, Ohio, The Barefruit Co. has satisfied customers throughout the United States and abroad. Barefruitco.com is hosted with a Green Certified EPA Green Power Partner. This means that the data centers and web servers supporting barefruitco.com are powered by 100% wind energy. We only ship our products in recyclable packaging. In an effort to reduce paper waste; we choose to email invoices, however, we are able to ship the actual paper invoice with your order, upon request. The Barefruit Co. does not, at any stage of production, test any of our products on animals." One of my readers will win a full size Pomberry Sugar Scrub!! Go to The Barefruit Co. and tell me another product you'd like to try! 2 entries-"Like" Barefruit Co. on Facebook and tell them you entered the giveaway on Hope's Cafe! 1 entry-Follow The Barefruit Co. on Twitter! This giveaway ends Monday, August 1, 2011, at 11:59 p.m. Please leave a valid email address in each comment, as this is how the winner will be notified. Winner will have 48 hours to respond, or another winner will be chosen. Giveaway open to US residents only. Disclaimer: I was not monetarily compensated in any way for this post. All thoughts and opinions are mine. All quotes taken from the Barefruit Co. website. I'd like to try the Women's Body Butter 8 oz. in Hibiscus. I would like to try their Women's Lip Balm. I would like to try the women's body wash in -like candy! I would also like to try the pomberry Women's Fragrance. PS- I think I changed my mind: I'd like to try the pomberry soy candle!!! I would love to try the Moisturizing Hair Conditioner. Please enter me. Thanks!! I also now follow you on twitter @hotchocolett! Thanks so much!